-	Dean, Office of Information Technology, Kaohsiung Medical University, Taiwan. -	Dean, College of Health Sciences, Kaohsiung Medical University, Taiwan. -	Chairman, Institute of Public Health, Kaohsiung Medical University, Taiwan. -	Director of Graduate Studies, Kaohsiung Medical University, Taiwan. -	Professor, Institute of Public Health, Kaohsiung Medical University, Taiwan. -	Associate Professor, Institute of Public Health, Kaohsiung Medical College, Taiwan. -	Lecturer, School of Public Health, Kaohsiung Medical College, Taiwan. -	Execute Assistant, Industrial Hygiene Research Center, Kaohsiung Medical College, Taiwan. -	Teaching Assistant, Department of Public Health, School of Medicine, National Taiwan University, Taiwan. Dr. Yang devotes his energies to the environmental epidemiologic studies last decade. The main interests of his researches are the health outcomes resulting from air pollution and various contaminants in drinking water. 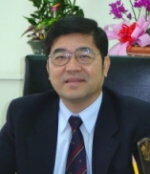 Dr. Yang has published approximately 100 SCI papers which he is the first or corresponding author as yet. In addition, he served as an editorial board member for several SCI and domestic journals and is a regular reviewer for many others. Yang CY, Chiu HF, Chang CC, Ho SC, Wu TN*. Bladder cancer mortality reduction after installation of tap-water supply system in an arseniasis-endemic area in southwestern aiwan. Environ Res. 98:127-132, 2005. Chang CC, Chiu HF, Wu YS, Li YC, Tsai ML, Shen CK, Yang CY*. The induction of vascular endothelial growth factors by ultrafine carbon black contributes to the increase of alveolar-capillary permeability. Environ Health Perspect. 113:454-460, 2005. Chiu HF, Chen CC, Tsai SS, Wu TN, Yang CY*. Relationship between magnesium levels in drinking water and sudden infant death syndrome. Magnesium Res. 18:12-18, 2005. Yang CY*, Chen YS, Chiu HF, Goggins WB. Effects of Asian dust storm events on daily stroke admissions in Taipei, Taiwan. Environ Res. 99:79-84. 2005. Chen YS, Yang CY*. Effects of Asian dust storm events on daily hospital admissions for cardiovascular disease in Taipei, Taiwan. J Toxicol Environ Health. 68:1457- 1464, 2005. Ho CK, Tseng WR, Yang CY*. Adverse respiratory and irritant health effects in temple workers in Taiwan. J Toxicol Environ Health. 68:1465-1470, 2005. Yang CY*, Tsai SS, Chang CC, Ho SC. Effects of Asian dust storm events on daily admissions for asthma in Taipei, Taiwan. Inhal Toxicol. 17:817-821, 2005.